Personal discoveries in data, Tableau, Alteryx. 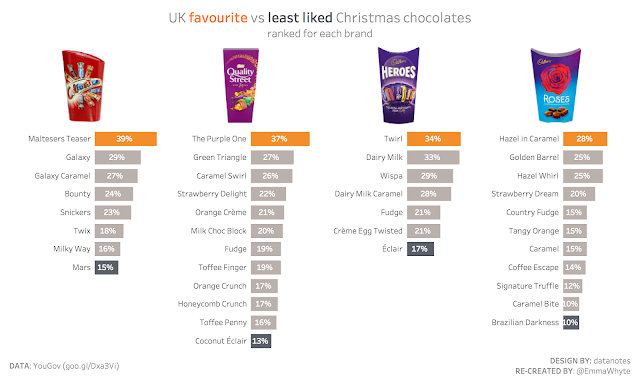 In the UK you'll find most households celebrating Christmas will have at least one box or tub of chocolate selection boxes. This year my family went for Cadbury Roses (although Celebrations are my favourite). I spotted this viz of the day on Tableau Public this week. I knew that I had to have a play with the data when I saw it. The data comes from a YouGov poll, but is only downloadable in a PDF format. While Tableau can read PDFs, this one wasn't formatted very well to work worth. So instead I opted for re-using the data in datanotes dashboard (exported to CSV). While exporting the data from the workbook, I noticed that the dashboard had been made with 4 sheets. I wondered, 'could it be done in one?'. This is your challenge this week! remake the dashboard below. The bar charts should all be made in one sheet / view. make sure you copy my colours - the favourite chocolate should be orange, the least favourite dark grey, and the rest light grey. You CANNOT use manual colours based on the chocolate name - it has to be based on the ranking of the chocolates in each brand. You'll need to download the data to get started too. That's all from #WorkoutWednesday for 2017! I wish you all a very Happy New Year and hope you've had a great Christmas too. Thanks to everyone who has participated in 2017 - you're all superstars! Tableau Zen Master, Certified Tableau Trainer and Consultant in the UK with The Information Lab. Tableau Server and Desktop Certified. Data Vizzer, cyclist, hiker, general outdoorsy person and occasional baker. Is investing in Tableau classroom training worth it?